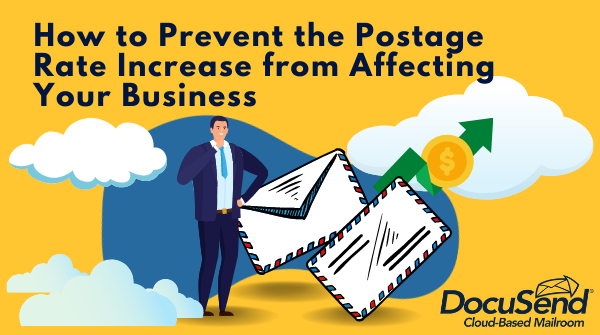 Overview: First Class Stamps are increasing 10% to $0.55 on January 27, 2019 but there are ways for your business to trim postage costs to help your bottom line. We’ve become accustomed to regular postage rate hikes from the United States Post Office. While you still get a great bang for your buck, the cost of mailing letters has increased significantly over the last decade. It’s still the safest and most cost-effective way of delivering important documents to your customers. Do you want the facts? Even though more than half of Americans pay their bills online, nearly 75% of American consumers still receive their bills and statements via the US Postal Service. So, clearly, businesses that listen to their clients still need to mail these important documents. We’ve discussed the reasons why consumers still like to receive financial documents in the mail in past blogs: online security concerns, keeping paper copies for their records, etc. – so this article will focus on the best way to trim those postage costs and keep the postage rate increase from hurting your bottom line. How can you accomplish trimming postage costs? This is a viable option if you have the resources to print and mail your invoices, bill statements, late notices, shutoff notices and other customer communications in house. You’ll incur the monthly lease payment for the meter, so be sure to see if the postage savings equals or exceeds the monthly lease. For example, with Pitney Bowes, you can save 5 cents on postage for each letter, paying $0.50 for single-piece metered mail versus $0.55 for a single-piece letter. But you’ll also pay anywhere from $36.99/mo to $56.99/mo for leasing the machine, as well as the ink costs. At the $36.99 lease price, you’d have to mail 740 envelopes to recoup the $0.05 savings. Not to mention, you’ll need to factor in the cost of having someone print, fold and stuff the envelopes as well as operate the meter. And don’t forget to look at all extra expenses. Watch out for additional fees, like processing or “reset” fees, along with charges for changes to your logo. You may even need an additional phone line to put postage on the meter. If you have small mail quantities or just like to apply stamps, consider buying Forever 50-cents stamps in large quantities. Calculate the quantity you’d need for the next two or three years, and buy them in bulk. However, it’s a big upfront cash outlay that not every small business can afford. But at least you’d be spared from the regular price increases. If you buy them before this year’s increase slated for January 27, 2019, you’ll only pay $0.50, saving you 5 cents per stamp for this year and even more in coming years. Using a service such as Stamps.com provides you with the ability to print postage on your envelopes using your existing desktop printer. You’ll pay a smaller monthly fee (currently $17.99/mo) than you would with a meter, but you buy the postage online, eliminating trips to the post office. And they don’t mark up the postage price. There are plenty of mailing services out there that will gladly mail your documents for you. Some of them require a monthly fee, but there are others, like DocuSend, who offer an all-inclusive price that covers materials, processing and postage without monthly fees. In fact, DocuSend is not passing on this year’s postal increase, so you’ll only pay $0.80 for a one-page black-and-white document. So for only $0.25 more than the $0.55 postage rate, your documents will be in the mail by the next business day. Guaranteed, it’s cheaper than doing the mailing yourself! When doing your mail house research, though, make sure you’re not required to sign a contract, and check to see if there are minimum quantity requirements. Read the fine print, because the low price they promote may be tied to a high volume of mail. It’s important to keep your customers happy by providing them their important documents via the postal mail, so do your homework before you commit to a mailing process. There are services available that will not only simplify your mailing activity but will also save you both time and money in the long run, on postage and resources. Just remember to be diligent and factor in all your actual costs before making a change. It’s your business that will benefit.